Draft: 2009, Los Angeles Angels, 1st rd. 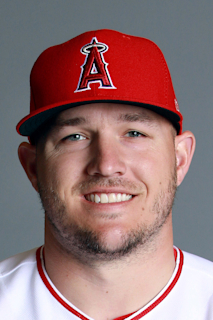 Michael Nelson Trout...On Twitter: @MikeTrout...Was the focal point in MLB Network Presents documentary series, Mike Trout: Millville to MVP, which debut in April 2017...In 2018, was the focus of an episode of ESPN's E60... Is an avid hunter in offseason...Also enjoys fishing, golfing, table tennis player (ping-pong) and weather forecasting... Activate participant in the Angels Baseball Foundation's monthly visits to the Children's Hospital of Orange County... Has appeared on the cover of several major publications including Men's Health, Sports Illustrated & ESPN The Magazine... On July 24, 2015, the Club unveiled a life-size bobblehead of Trout to commemorate his MVP Award... The bobblehead currently sits on the Terrace Level near sections 221... In 2014, President Obama referred to Trout during a speech discussing the versatility of the farm bill... "It's like Mike Trout, for those of you who know baseball. It's somebody who's got a lot of tools and multitasks."... During the 2014 season, Nike debuted the Nike Lunar Vapor Trout...Is just the second baseball player to have their own signature Nike shoe, joining Ken Griffery Jr.... Company released the second edition in 2015, third in 2016, fourth in 2017 and fifth in 2018... Had scholarship to East Carolina University before being drafted by Angels...Switched from shortstop to outfield as a senior at Millville H.S. in New Jersey...Set the New Jersey high school record with 18 home runs as a senior....Tossed a no-hitter against Egg Harbor Township... At one point during career, tried to switch hit...Was an All-Conference basketball player and was the high school's quarterback and safety...In 2013, high school renamed their baseball field after him... Father Jeff played in Twins farm system after being drafted by Minnesota in the 5th round out of the University of Delaware...Prior to his retirement, Jeff Trout taught and coached football at Millville H.S...Originally signed by Angels scout Greg Morhardt...Morhardt played in minor leagues with Jeff Trout...Only player to appear at the MLB Network studios for 2009 draft. In eighth big league season (seventh full) with the Angels, finished second in the A.L. Most Valuable Player voting to Boston's Mookie Betts...Marked seventh time in seven full seasons finishing in the Top 4 and sixth time placing first or second (won in 2014 and 2016)...Is one of four players to finish second in the MVP vote at least four times during their careers: Stan Musial (4), Ted Williams (4) and Albert Pujols (4)...According to ELIAS, is one of three players to finish in the Top 3 of the MVP voting six times in a seven-year span, joining Yogi Berra and Albert Pujols...Finished in the Top 10 for the American League in several offensive c ategories i ncluding, a verage ( .312, 4 th), o nbase percentage (.460, 1st), slugging (.628, 3rd), runs (101, 9th), home runs (39, T4th), stolen bases (24, 9th), walks (122, 1st) and intentional walks (25, 1st)...Awarded a Louisville Silver Slugger for the sixth time in career...For more info, see Career Summary Section... Missed 15 games due to right wrist inflammation...Marked second career trip to the D.L...Sustained the injury sliding into third base Aug. 1 in Tampa Bay... Per MLB, was the 11th most popular player jersey according to sales on MLBShop.com. Logged 39 home runs the second-most of career (41 HR in 2015)...Marked third 35+ home run season, the most in franchise history. Joined Alex Rodriguez, Jimmie Foxx, Jose Canseco and Joe DiMaggio as the only players in American League history to hit 30 home runs five-or-more times before their age-27 season...Also join Alex Rodriguez and Mickey Mantle as the only A.L. players all-time to amass seven seasons of 20+ home runs prior to their age-27 season... On June 12, homered for the 223rd time, passing Brian Downing for sole possession of third in franchise history...Enters 2019 needing 32 home runs to tie Garret Anderson for second. Drove in 79 RBI in 140 games...Was the fourth player in baseball history and first in franchise annals to log 35+ home runs and drive in less than 80 RBI... 648 career RBI rank fifth in Club history. Reached the century mark in runs scored for the sixth time in career…Is just the seventh player all-time (3rd in A.L. history) with six, 100-run campaigns prior to their age-27 season: Alex Rodriguez (7 seasons), Albert Pujols (6), Hank Aaron (6), Mickey Mantle (6), Mel Ott (6), Bill Dahlen (6)... Six career 100-run seasons are the most in franchise history…No other player had more than two…793 career runs scored rank fifth in franchise history. Stole 20+ bases for the fifth time in six Major League seasons...One of two players all-time to log four seasons of 25 home run and 20 stolen bases prior to their age-27 campaign: Darryl Strawberry. Led the Junior Circuit in walks (122) for the third time (also, 2013 and 2016)...For more info, see chart to right... Set a new single-season franchise record for walks, breaking his old mark of 116 set in 2016...The 122 walks were tied for the eighth most by a center fielder all-time (since 1871) and the most since Lenny Dykstra's 129 in 1993 with the Phillies...Reached 100 walks, 25 HR and 20 steals in a season for the third time in career (2013 & 2016)…Joins Barry Bonds (7 times), Bobby Abreu (3) & Jeff Bagwell (3) as the only players ever to do so at least three times in career. and Tim Salmon in '00)…The 84 free passes were the most by an A.L. player before the break since Frank Thomas (84 BB) in 1994... Joined Joe Morgan (1974) as the only players ever to amass 100 H, 80 BB and 15 SB prior to the All-Star Break. Named to the American League All-Star team, starting the game in center field...Went 1-for-2 with a home run, an RBI, run scored and a walk…Marked second career home run in the All-Star Game...Nominated as an All-Star for the seventh time in career and a starter for the sixth consecutive season…Set franchise record for most All-Star Game selections and joined Rod Carew (1979-84) as the only Halos to be selected as a starter in six consecutive Midsummer Classics…For more info, see Career Summary Section (eighth bullet point). One of five Major Leaguers to post a 1.000 fielding percentage (min. 108 G)…Last error came April 6, 2017 (250 consecutive games) and has made just one error in last 336 tilts (spans to June 28, 2016)...Per Fangraphs.com, eight defensive runs saved led American League center fielders while his 4.0 UZR was second...The eight DRS ranked fifth in franchise history by a center fielder (Trout owns record with 21 DRS in 2012). Named the American League's Most Valuable Player as voted on by the Baseball Writers Associati on of America (BBWAA) aft er leading the Majors in runs (123), walks (116) and OBP (.441) and ranking in the Top-10 in several of the A.L. 's off ensive categories including average (5th), triples (T10), steals (T2nd) and slugging (.550; 4th)...Received his second MVP honors (unanimous winner in 2014) aft er garnering 19 fi rst place votes, eight second place votes and one third place vote, for a total of 356 points, 45 points ahead of second place fi nisher Mookie Bett s of the Boston Red Sox (311 points)...For more MVP info, please see Career Summary section...Won fi ft h consecuti ve Louisville Silver Slugger Award...For more info, see Career Summary secti on...Became the fi rst player to lead the A.L. in walks and runs since Trout did so in 2013 (prior to Trout, the last player to lead the A.L. in both categories was Frank Thomas in 1994)...Was the only player in the Majors to bat .315 with 100 RBI, 100 R and 100 BB and the fi rst American Leaguer to do so since Miguel Cabrera in 2011...Became the fi rst to boast those numbers in a season before their age-25 campaign since Alex Rodriguez in 2000...Finished the season as one of two American Leaguers to post a .300/.400/.500 slash line (David Orti z)...joined Ty Cobb (1915) as the only players ever to hit .315, walk 115 ti mes, score 120 runs and steal 30 bases...According to STATS, this year became the second youngest player with 25 HR, 25 SB and 100 BB in a season…Youngest was Trout in 2013...Became the 12th player in American League history to log a 100 R/100 BB/ 100 RBI season prior to their age-25 campaign: Ted Williams (2 ti mes), Troy Glaus (2), Frank Thomas (2), Mickey Mantle (2), Jimmie Foxx (2), Lou Gehrig (2), Alex Rodriguez (1), John Olerud (1), Reggie Jackson (1), Charlie Keller (1) and Babe Ruth (1). In fifth big league season (fourth full) with the Angels, hit .299 (172-for-575) with 32 doubles, six triples, 41 home runs, 104 runs scored and 90 RBI... Set career highs in home runs, OBP (.402) and slugging (.590). Finished in the Top 10 of several of the American League's offensive categories including average (9th), runs (3rd), home runs (T3rd), walks (92, 3rd), OBP (2nd) and slugging (1st)... One of two Angels to ever lead the league in slugging percentage, joining Bobby Grich in 1981 (.543). Finished second in the A.L. MVP race... Garnered 304 points (seven first place votes), 81 points behind Toronto's Josh Donaldson... Marked fourth consecutive season finishing in the Top 2 of the A.L. MVP race... Joined Yogi Berra as the only players to accomplish the feat... Is one of five players to finish second in the MVP vote at least three times during their careers: Stan Musial (4 times), Ted Williams (4), Albert Pujols (4) and Mickey Mantle (3). Received fourth career Louisville Silver Slugger award and was a finalist for the American League's center fielder Rawlings Gold Glove award. With 41 home runs, tied Troy Glaus (41 HR in 2001) for the second most home runs hit in a single season in franchise history. One of 11 American Leaguers to hit 40 home runs in a season prior to their age 24-year-old campaign and first since Troy Glaus did so for the Angels in 2000 (47 HR). Hit 26 home runs prior to the All-Star Break, tying the franchise record... One of six A.L. players with 25 homers before the All-Star break in their age 23-year-old season or younger... 2015 marks second season with at least 20 home runs prior to Midsummer Classic, joining Albert Pujols (2001-03), Jose Canseco (1986 and 1988) and Eddie Mathews (1955 & 1953) as the only players to accomplish the feat prior to their age-24-year-old season. He and Albert Pujols were just the fourth pair of teammates to log 25 home runs before the All-Star break and first since Ken Griffey Jr. and Alex Rodriguez did so for the Mariners in 1998. For second straight season, homered in first at-bat of the season (both came vs. Felix Hernandez). Hit two grand slams, becoming the first Halo with multiple grand slams in a season since Vladimir Guerrero in 2005. Reached the century mark in runs scored for the fourth consecutive season... First player in franchise history to lead the team in runs scored four consecutive seasons. Tabbed an All-Star for the fourth time in his career (fourth full season)… Just the third A.L. outfielder to make four All-Star Games before his 24th birthday: Ken Griffey Jr., Al Kaline and Mickey Mantle… Joined Ken Griffey Jr., Ted Williams, Ivan Rodriguez, Mickey Mantle, Al Kaline, Joe DiMaggio and Rod Carew as the only A.L. players to make three starts before their 24th birthday. Went 1-for-3 with a home run, a walk and two runs scored en route to capturing second career All-Star Game MVP award (also, 2014)… Is the first player ever to win the award in consecutive seasons and just the fourth to be named the Midsummer Classic MVP multiple times in their career. Hit sixth leadoff home run in All-Star Game history and first since Bo Jackson in 1989 at Anaheim Stadium… With a single in 2012, a double in 2013, a triple in 2014 and a homer in 2015 (all in his first at-bat of the game), joined Lou Whitaker, George Brett and Ted Williams as the only players to tally an All-Star Game cycle during their career. Played flawless defense in 156 games in center field (1362.2 innings)... Was the first Angels center fielder to play at least 150 games in a single season without committing an error and just the second Halo outfielder to do so (Brian Downing in 1982)... Was the first American League center fielder to accomplish the feat since Curtis Granderson in 2012 and just the fourth (fifth occurrence) to do so since 2000. One of seven players all ti me to score 100 runs, tally 40 home runs and steal 10 bases in an age-23-year-old season or younger: Troy Glaus in 2000, Alex Rodriguez in 1999 and 1998, Ken Griffey Jr. in 1993, Jose Canseco in 1988, Reggie Jackson in 1969 and Orlando Cepeda in 1961. Named the American League Player of the Month for July aft er hitting .367 (29-for-79) with 12 home runs and 24 RBIs in 21 games… The 12 homers led the Majors while the 24 RBIs were tied for first… 12 home runs marked the most hit in a single month in his career and tied a franchise record for home runs in the month of July… Marked third "of the Month" award: June 2014 and July 2012. Named unanimous winner of American League Most Valuable Player Award as voted on by the Baseball Writers Association of America (BBWAA) after batting .287 (173/602) with 39 doubles, nine triples, 36 home runs, 111 RBI, 83 walks, 16 stolen bases and 115 runs scored with Angels...Third Halo to win the award, joining Vladimir Guerrero (2004) and Don Baylor (1979)...Tallied a total of 420 points (all 30 first place votes) and finished 191 votes ahead of second place finisher Victor Martinez...Just 17th unanimous winner (18th occurrence) in MVP voting process (10th in A.L. history) and youngest ever to accomplish the feat...Set career-highs in home runs and RBI while matching a career best in doubles and triples...Ranked in Top 10 in several A.L. offensive categories including, runs (115, 1st), RBI (111, 1st), extra-base hits (84, 1st), triples (9, 3rd), slugging percentage (.561, 3rd), walks (83, 4th), home runs (36, T4th), doubles (39, 6th), OBP (.377, 7th)...His 84 extra-base hits led Majors and rank third in Club history, trailing only G. Anderson's 88 and T. Glaus' 85...Just fourth player since 1901 with 115 runs scored, 35 doubles, five triples and 35 home runs in their age-22-year-old season or younger: Alex Rodriguez in 1998, Joe DiMaggio in 1937 and Hal Trosky in 1934...First American League player since Hank Greenberg in 1937 to have at least a .939 OPS, 36 home runs, 39 doubles, and nine triples...Named to third consecutive All-Star game, fourth A.L. outfielder with three All-Star selections before turning 23, joining Mickey Mantle, Al Kaline and Ken Griffey Jr...Named as Ted Williams Most Valuable Player of Midsummer Classic after 2-for-3 with a double, triple, two RBI and a run scored...Joined Ken Griffey Jr. in 1992 and Ted Williams in 1941 to have multiple extra-base hits in an All-Star Game before turning 23...At 22 years, 342 days old, is second-youngest player to win award, behind only Ken Griffey, Jr. (1992) at 22 years, 236 days...Fourth Angel to win award, joining Leon Wagner (1962), Fred Lynn (1983) and Garret Anderson (2003)...Won third consecutive Louisville Silver Slugger Award (for more info, see career summary section)...Finished first half of season batting .310 (107/345) with 26 doubles, five triples, 22 home runs, 73 RBI and 65 runs scored... Since 1914, is one of five players to log 25 doubles, 20 home runs and 5 triples before All-Star break: Duke Snider in 1954, Chuck Klein in 1932, Chick Hafey in 1929 and Lou Gehrig in 1927...Signed six-year contract extension, March 28. Followed up rookie campaign by batting .323 (190/589) with 109 runs scored, 30 doubles, nine triples, 27 home runs, 97 RBI, 33 stolen bases and 110 walks... Finished the year ranked in the AL top 10 in several offensive categories including: average (.323, 3rd), hits (190, T4th), runs (109, 1st), doubles (39, T7th), triples (9, 2nd), RBI (97, 9th), walks (110, 1st), slugging (.557, 4th), OBP (.432, 2nd) and stolen bases (33, 8th)...Was the first Major Leaguer to lead the league in walks and runs scored since Jeff Bagwell in 1999 with Houston and first AL player to do so since Frank Thomas in 1994.Became the first player in American League history with 100 walks, 70 extra-base hits and 30 stolen bases in a season…Also the first player in AL history with 25 home runs, 30 stolen bases and 100 walks in a single season... Joined Ty Cobb (1915) and Lenny Dykstra (1993) as the only players since 1900 to tally 190 hits, 100 walks and 30 stolen bases in a season... Set a new franchise record by reaching base safely 309 times...Also broke Rickey Henderson's mark (301) for times on base by a player in his age-21 or younger season... Became the second-youngest player with 25 home runs and 30 stolen bases in a season…Only other player younger was Trout in 2012. Completed rookie campaign with Angels batting .326 (182-for-559) with a Major League leading 129 runs scored, 30 home runs, 83 RBIs and 49 stolen bases...Became first player in Major League history to steal 45 bases, score 125 runs and hit 30 home runs in a single season...Also is only Major Leaguer to ever hit .320 or above with 30 homers and 45 steals in single campaign...Fell one stolen base shy of joining Barry Bonds and Eric Davis as only players to post a 30 HR/50 SB season...In voting by BBWAA, named unanimous winner of American League Rookie of Year, becoming just second Angel to win award (Tim Salmon in 1993)...Received all 28 first-place votes, making him 18th unanimous selection in history of award and just eighth in AL history...Finished second in voting for AL Most Valuable Player Award...Recieved six first-place votes and 281 total points...Highest finish by a rookie in MVP race since Ichiro Suzuki won award in 2001...First rookie in ML history to record a 30 HR/40 SB season...One of six rookies to hit .320 or above with 30 or more home runs: Hal Trosky - .330, 35 HRs in 1934; Ted Williams - .327, 31 HRs in 1939; Walt Dropo .322, 34 HRs in 1950; Tony Oliva - .323, 32 HRs in 1964; and Albert Pujols - .329, 37 HRs in 2001...Finished year in AL's top five in several offensive categories including, average (2nd), runs scored (1st, led Majors), steals (1st, led Majors), slugging (.564, 3rd) and on-base percentage (.399, 3rd)...Became first player to hit above .320 with 30 HRs and 125 runs scored since Albert Pujols in 2005 and first AL player to do so since Manny Ramirez in 1999 (w/ CLE)...Missed first 20 games of Major League season after starting year with Triple-A Salt Lake...Recalled on April 28 after batting .403 (31-for-77) with four doubles, five triples, a home run and 13 RBIs in 20 games with Bees. Named Angels' top prospect for 2012 by Baseball America...Does qualify as a rookie in 2012...Played majority ofcampaign with double-A Arkansas...Named as Baseball America's 2011 Minor League Player of the Year...SecondAngel in club history to earn award (Tim Salmon, 1992)...Also named The Sporting News 2011 Minor League Playerof the Year and named to the Topps Double-A All-Star team...In 91 games with Travs, batted .326 (115/353) with82 runs scored, 18 doubles, 13 triples, 11 HR, 38 RBI and 33 stolen bases...Posted a .544 slugging pct. and .414on-base pct. (.958 OPS)...Trout led the Texas League in batting average, on-base pct., OPS and stolen bases(tied)...In 266 career minor league games, he is batting .338 (351/1040) with 104 extra-base hits, 102 stolenbases, .422 OBP and .508 slugging pct. (.930 OPS)...Had contract selected by Angels July 8 and made MLB debutas starting centerfielder (0/3) that evening...At age 19 years, 335 days, was youngest player to make big-leaguedebut for Angels since May 30, 1971, when Andy Hassler debuted at age 19 years, 224 days...Bunt single off M.Pineda in 3rd inning July 9 vs. Seattle marked first Major League hit...RBI-single in 6th on July 15 at Oaklandmarked first career RBI...Hit first ML HR (3-run) July 24 at Baltimore in front of several family members andfriends in attendance from New Jersey...Made 32 starts in outfield with Angels (club was 21-11 in his starts)...Two weeks shy of his 20th birthday, became the third teenager to homer for the Angels, joining Ed Kirkpatrick,who hit four homers for the Halos before turning 20 (1963-1964, including two at age 18) and Aurelio Rodriguez(at age 19 in 1967, also against the Orioles)...Enjoyed the best game of his young career August 30 at Seattle(2/4, 3 R, 2 HR, 5 RBI)...At 20 years and 23 days old, became the youngest Angel with two HRs in a game(previously Tom Brunansky at 20 years, 234 days in 1981)...Regarded as baseball's top prospect by several scoutsand baseball publications during 2011 campaign...Participated in Arizona Fall League following season. In 2010, named Topps Minor League Player of the Year at age 19 to become the youngest recipient in the history of the J.G. Taylor Spink Award...Also named to Baseball America's Minor League All-Star Team and honored as the Midwest League MVP...Played in the 2010 XM All-Star Futures Game at Angel Stadium going 2-for-4 with a double and two runs scored in the U.S. team's 9-1 win. Named New Jersey Gatorade Player of the Year in 2009...Earned All-State honors in 2008 and 2009. 24 de agosto de 2018 Los Angeles Angels activan a CF Mike Trout de la 10-d&iacute;a lista de lesionados. 10 de agosto de 2018 Los Angeles Angels ponen a CF Mike Trout on the 10-d&iacute;a lista de deshabilitado retroactivo al August 6, 2018. Right wrist inflammation. 14 de julio de 2017 Los Angeles Angels activan a CF Mike Trout de la 10-d&iacute;a lista de deshabilitado. 5 de julio de 2017 Los Angeles Angels envian a CF Mike Trout una asignaci&oacute;n de rehabilitaci&oacute;n a Inland Empire 66ers. 28 de abril de 2012 Los Angeles Angels llamado Mike Trout de Salt Lake Bees. 30 de marzo de 2012 Los Angeles Angels opcionado Mike Trout para Salt Lake Bees. 19 de agosto de 2011 Los Angeles Angels llamado Mike Trout de Arkansas Travelers. 1 de agosto de 2011 Los Angeles Angels opcionado Mike Trout para Arkansas Travelers. 8 de julio de 2011 Los Angeles Angels seleccionado el contrato de Mike Trout de Arkansas Travelers. 4 de abril de 2011 Mike Trout asignado a Arkansas Travelers de Inland Empire 66ers. 28 de enero de 2011 Los Angeles Angels invitado fuera del roster CF Mike Trout para spring training. 13 de julio de 2010 CF Mike Trout asignado a Rancho Cucamonga Quakes de Cedar Rapids Kernels. 10 de julio de 2010 Mike Trout estado en la lista cambian a por Cedar Rapids Kernels. 20 de marzo de 2010 CF Mike Trout asignado a Los Angeles Angels. 1 de septiembre de 2009 CF Mike Trout asignado a Cedar Rapids Kernels de AZL Angels. 5 de julio de 2009 AZL Angels firmado Mike Trout. 1 de julio de 2009 Los Angeles Angels firmado OF Mike Trout.